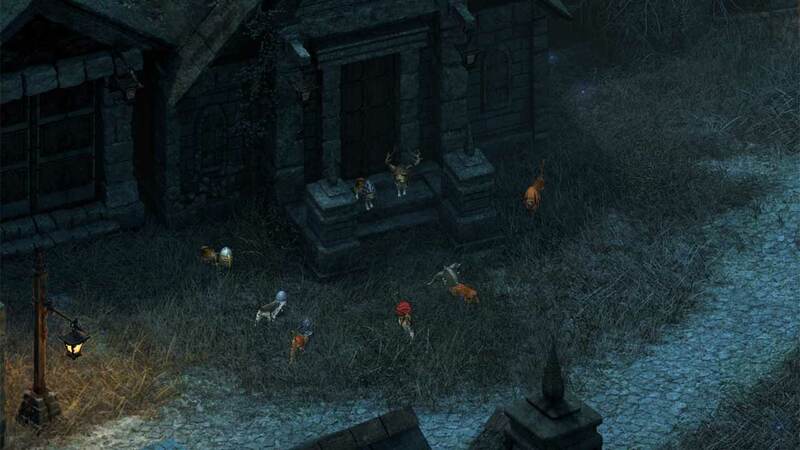 It's come to our attention that a piece of backer-created content has made it into Pillars of Eternity that was not vetted. Once it was brought to our attention, it followed the same vetting process as all of our other content. Prior to release, we worked with many of our backers to iterate on content they asked to be put into the game that didn't strike the right tone. In the case of this specific content, we checked with the backer who wrote it and asked them about changing it. We respect our backers greatly, and felt it was our duty to include them in the process. They gave us new content which we have used to replace what is in the game. To be clear, we followed the process we would have followed had this content been vetted prior to the release of the product. 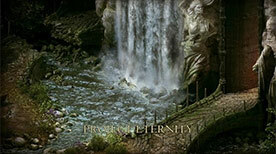 We appreciate the faith you have all given us into making Pillars of Eternity the great game that it has become, and we appreciate the strength of conviction all of you bring to every conversation we have together. As some of you may have seen already, the game has started shipping out. When your shipment is sent, you should get an email sent to your email on record in the Backer Portal stating that it is in transit. People in the United States should be seeing their physical items coming in very soon - if they haven't gotten them already. Our shipments going out to Europeans should be landing in the U.K. early next week. At that point the shipments will start going out to folks. The best estimate that we have currently is that people will start seeing their shipments arrive around the middle of April. For those people who only have a standard physical copy of the game and no additional physical goods, the box will ship once the discs are finished being pressed. You shouldn't be hindered from playing the game as we have made sure that all physical copies of the game were also given a digital copy. You can go to your Products tab in the Backer Portal to redeem your key if you have not done so already. One last note, if you were late in confirming your pledge and placing your order your items will be sent in a later shipment. We appreciate your patience as we try to get your rewards to you as fast as we can. Hello, Backers. The Pillars team has been hard at work collecting feedback and fixing bugs for our upcoming 1.03 patch. The focus of this patch was to quickly identify issues that were causing the biggest problems for the community and work to getting those fixes out as soon as possible. Note: We currently have an issue with adventurer hall-created companions not being able to lockpick on old saves. We are looking to hotfix it, but if you feel this will affect you, you may want to wait on the hotfix. Bears and Cats can now be equipped with hats. This is most likely not a joke... but might be a joke. We have fixed a problem where attributes on characters could permanently increase by equipping certain items. This will also retroactively fix the problem in saved games that have characters with this issue. The crash in Raedric's Hold has been fixed. We fixed the looping audio sounds that can occur if you play with minimized tooltips. Previously Wizard summoned items could persist after the spell's duration. This has been fixed and it will also retroactively fix the problem in saved games that have characters with this issue. The items Drinking Horn of Moderation and Talisman of the Unconquerable were causing Ciphers to permanently lower their amount of focus gain. We've included a fix to retroactively resolve the issue on Ciphers but the effect is still on the items. Unfortunately the fix will not fix the broken effect on those items, so you'll need to keep those items unequipped until the next patch. If you do equip them, perform a Save/Load to fix your Cipher. 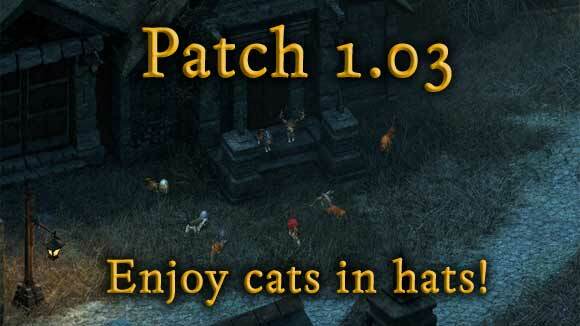 We released this patch earlier today on Steam. You can start downloading it by quiting out of your Steam client and starting Steam up again. The patch should download at that point. For those of you that have Origin and GOG, we are working with them to patch their platforms as soon as possible. We are hoping for all platforms to be up-to-date within a few days. Added pro tips to the Glossary. Many new icons for items. Added graphics setting to toggle antialiasing levels. Added new voice set reactivity for lockpick, poison, enemy spotted in stealth, spell failure, death, immobilized, and completed task. Added indicators on the loot screen when looting crafting and quest items. Party can now use lockpicks that are in the Stash. You can now cast AoEs on party member portraits and the spell will be targeted at the companion's location. Digital soundtrack now includes track names, track order, metadata/tags, and album art. Monk unarmed attack buffed by 1 point at the top end. Arbalest damage has been lowered. Fast melee weapons do slightly more damage. Slight bump to sabre damage. Tuned ranges of many Wizard spells to be higher. Slicken spell is now a single hit AoE. Chill Fog is now a friend or foe spell. Curse of Blackened Sight is now foe only. Changed reload speed multiplier from 2 to 1.2 for Sure-Handed Ila. Fixed the price on Seal of Faith. Tuned up the Goldrot Chew. Reduced the penalties for Bonded Grief. Tuned up Bulwark of the Elements. Modified attributes of companions and Itumaak. Raised the bonus for having fewer than six party members from 5% per character under the limit to 10% per character under the limit. Added cooldown to NPC Rogue's Escape ability usage so they won't use it back to back. Rebalanced fight difficulty and spell selection for the Old Watcher. Lowered the scale of the Defiance Bay reputation by 15%. Beloved Spirits adds 0.4 Endurance to Ancient Memory instead of 2. Changed duration of the Flagellant's Path defense penalty. Adjustments to the Mantle of the Dying Boar. Reduced the price of the Brighthollow Hearth and Courtyard Pool. Heart of Fury will now apply to all damage types. Tuned damage on Brilliant Radiance down. Changed one of the fatigue status effects to not end with combat. Fixed save game issues with spells and abilities that place down traps. Fixed issue to prevent Ciphers from casting abilities without the required Focus. Restored modal flag for Reckless Assault. Set Transcendent Suffering to not be combat only. Fixed duration issue with Plague of Insects. Fixed companion audio triggers for some status effects. Fixed issue with Wizard's summoned magical items getting stuck after save and load. Wizards will be restored to a proper state after loading a game. Hunting Bows had the wrong speed descriptor. They are now listed as Fast. Character Hit Autopause option should be working as intended. You can now close the Grimoire and Chant UI with a hotkey. Fixed issue with summoning magic items while unarmed. Fixed delay issue on Knockdown. Fixed a few issues with Dominate and Charm spells. Fixed a bad item mod on the Ring of Protection. Fixed issue with the Terrible weapon mod. Changed bad data in ranger summons. Made Takedown to be consistent with Knockdown. Summoned weapons will be removed when Spiritshifting. Fixed issue with bouncing reflected melee attacks. Party members will no longer switch to different weapons after being Charmed or Dominated. Ancient Memory is now Ally only. A summoned weapon will not unequip the grimoire. Fixed trigger count issue with the Prone reduction mod. DOT spells should clean up properly when combat ends. All Exhortations are now combat only. Only play weapon ineffective VO if the attack is hostile. Aggrandizing Radiance will now last until combat ends. Holy Radiance is now combat only. Fixed issues with factions and super friend quests with Lady Webb's dialogue. Adjusted trigger in front of the Salty Mast to fix a possible way to skip a required cutscene. Fixed issue with the Winds of Steel quest line. Fixed a trigger outside the First Fires Keep that could have been avoided. Many fixes to music, audio, and VFX to a scene near the end of the game. The prybar should now display the correct image in the Raedric's Hold moat scripted interaction. Changed faction on the Hall of Warrior's containers. Fixed scripted music for the forge knight combats in the keep. Visual effects in the introduction cutscene should now be triggered properly. Fixed conversation of the guards in Raedric's Hold to not repeat. Added cape and armor to the loot for the Fampyr boss. Fix to Osrya's starting timer not being attached to the trigger in the area. Fixed sound issue when collapsing the tutorial UI. Fixed issue with double clicking items to equip. This is a retroactive fix and will restore characters with proper stats. Fixed issue where camping supplies were disappearing when added to Stash. Cage Cursor setting should not turn off after loading a scene or cutscene and is now on by default. Fixed cropping on a few portraits. Fixed issue with highlighting dead bodies and containers in the fog of war. Fixed item stacking issue that was stacking items inappropriately. Reduced the intensity of the explored fog of war on the area map, and fixed an issue where the shadow layer was causing the area map to be darker than it should be. Small UI updates to the journal screen. Reworked the enchanting UI to work better with multiple lines. Fixed UI sorting issue in store. Fixed UI sorting in crafting menu. Fixes to Capitular glyphs in end game slides. Fixed issue with stronghold alert widgets not hiding properly. Fixed an issue with weapon mods were incorrectly being displayed in some cases. Drag select should work properly when starting the drag over an enemy. Fixed a few issues with drag select and formation rotation causing issues when the mouse goes over UI elements. Fixed some control issues with holding down keys. Shot on the Run recovery value should be now displayed correctly. Fixed issues to how the HUD fades out during conversations. When the party receives or loses items, those log messages now go to both logs. Cleaned up the character sheet formatting and made more items clickable. Store item names can now take up two lines. Spells now show DT bypass in the description. Consumables now show per-Rest and per-Encounter usage limitations. Fixed stats issue with saving and loading on the same map where a companion is found. This is a retroactive fix and will restore companions and characters to the proper state. Fixed issues with save games in Raedric's Hold, causing the game to not function correctly or freeze. Ranger Animal Companions should not disappear anymore and broken animals will be restored after loading and saving the game. Fixed possible issues with disappearing items and weapons. Minor fixes to a few select voice over lines. Fixed size issues with equipped capes on Godlike characters. Changed Explorer achievement to check for 152 maps rather than 160. Fixed many issues where combat would not end properly. Updated credits with more backer names. Updated paperdoll level up lighting. Scripted music should now be restored properly after loading a game. Updated Temple of Eothas render. Fixed some rendering issues with Fog of War on some areas. Fixed sounds on movie that plays near end of game. Fixed issue with weapon caching causing issues when weapons are swapped. Interstitial music no longer loops. Fixed issue where party members could take damage in cutscenes. Fixed voice cues during looting for full inventory. Fixed transparency on ghost characters. Fixed issues with cutscene pathfinding if the game's process is halted. Fixed issue with Expert mode settings getting saved improperly. Fixed issue where characters were not properly stopping at the last waypoint of their path. We now handle some edge cases in resolution management on some hardware configurations. Fixed issue with the party member Knockout achievement not reporting the correct numbers. 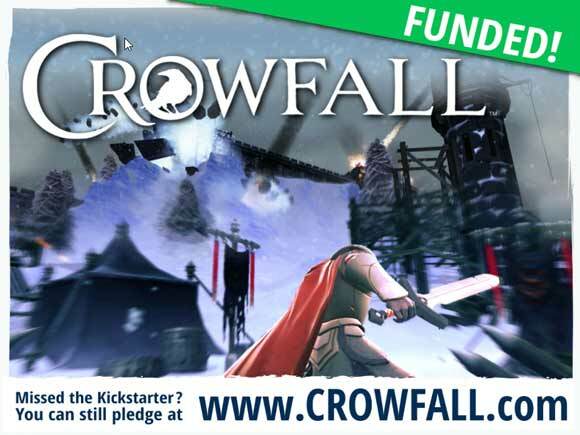 Our friends at ArtCraft Entertainment just finished up their Kickstarter for Crowfall, a really cool MMO being made by some serious industry vets. In Crowfall, players each get their own personal Kingdoms that they own and that other players can visit. Kingdom owners have full control over who can enter, trade rules, and taxes. It has the potential to be really amazing. Mix in the Campaign Worlds, limited time campaigns that players can play through, and you have a recipe for a great time. If you missed out on the Kickstarter campaign, you can still pledge now. Just head over to their website for more details.